The USASF Cheerleading Worlds Championship is held annually at the Walt Disney World Resort in Orlando, Florida at the ESPN Wide World of Sports Complex. Twelve divisions make up the elite championship for all star cheerleading for Level 5 and Level 6 athletes from around the globe. *Ties are broken by deductions. Donned in their plain black robes, the men and women of the U.S. Supreme Court spent an hour talking about stripes and zigzags on cheerleading uniforms. The case could have big repercussions for the fashion industry. Varsity Brands, the country’s largest maker of cheerleading uniforms, wants to keep its patterns of zigzags and stripes copyrighted. But, a smaller company argues Varsity has no right to copyright the designs’ use on clothes. The issue is tricky because clothes are normally difficult to copyright because their design is directly tied to their function, and federal law doesn’t allow designs to be copyrighted unless they can stand alone. Although Varsity’s direct competitors tend to side with Star, the lawsuit has support from the fashion industry, which has very limited copyright protections. Currently, the style or cut of a garment is not eligible, but a pattern on it, such as the impression of a Mondrian painting on a renowned Yves Saint Laurent dress, can be protected. However, Varsity Brands argues its stripes can be separated from the dress, and used on other clothes and objects. Varsity has filed multiple lawsuits against competitors, claiming copyright violations. Its competitors say that Varsity claims protection for items that are ubiquitous and too generic to merit copyrights. Her company, known for its customized outfits with a high ratio of crystals, has also received legal threats from Varsity. Ms. Noseff Aldridge said she was “actively ignoring” a cease-and-desist letter Varsity sent to her after a young customer, who was hired to promote Rebel Athletic apparel, posted photos to the company’s Snapchat account that showed herself in a group photo with other girls wearing Varsity uniforms. The case could have major repercussions for both the $300 million cheerleading apparel market, and the even larger fashion industry. In fact, the Council of Fashion Designers of America filed an amicus brief supporting Varsity’s right to copyright the uniforms. The National Advisory Board is democratically elected to support athletes and members by addressing emerging issues of broad potential impact and developing policies for the organization when needed. Who is eligible to serve: All USASF Professional Members. Membership: Members are nominated by their peers and voted in by the USASF membership. Commitment: Members must comply with the NAB Code of Conduct and attend both semi annual meetings. David Hanbery – Deep South Cheer and Dance, Inc.
Angela Robbins Hull – Rebel Athletic, Inc.
A legend of the cheerleading world has passed away. Lawrence “Herkie” Herkimer is known today as the father of modern day cheerleading. He was born in 1925 and is credited for creating the Herkie cheerleading jump, which was named after him, and also received a patent for the pom-pon which he created alongside the spirit stick. Herkimer passed away on July 1, 2015. Herkimer was a cheerleader at Southern Methodist University (SMU) and started his first cheerleading camp in 1948. Herkie is the founder of the National Cheerleaders Association (NCA) which began with just 53 participants. The following year, enrollment in his camps had soared to over 350 participants. By the 1950s most high schools had created a cheerleading squad. Before long, he gave up his teaching career with Southern Methodist and took up cheerleading full time. His camps employed about 1,500 instructors teaching cheerleading across the U.S. along with his company – Cheerleader Supply Company that was started to supply cheerleading teams with uniforms and camp clothing. The father of modern day cheerleading, Lawrence Herkimer, passed away on July 1, 2015. By the 1960s, just about every high school and college in the country had cheerleaders. Professional cheerleading was introduced around this time under the National Football League and its leader was the Dallas Cowboys debuting during the 1972-73 season. They were first widely viewed at the 1976 Super Bowl X game, changing the face of cheerleading as a profession. In 1986, Herkimer sold his cheerleading company for $20 million to the BSN Corporation. In June 1988, BSN Corporation sold NCA to the Prospect Group with Herkimer staying on to run the company which was bringing in approximately $50 million in revenue by 1990. With the invention of color television and a need for a visually appealing device for cheerleading, Herkimer invented the pom-pon and was granted patent 3,560,313 from the US Patent and Trademark Office in 1971. Herkimer is also credited as the inventor of the spirit stick after awarding a spirited team at one of his camps a piece of a tree branch that would later become mass produced as the infamous Spirit Stick that teams and camps across the world know and are still awarded today. NCA was later acquired by Varsity Spirit Corporation and became a part of the Varsity Family which was started by Jeff Webb, the founder of UCA, who was at the time a general manager for NCA. The sport we know as cheerleading today was largely influenced by the efforts of Lawrence Herkimer. Without his ingenuity and influence in the industry, we wouldn’t have the sport that we know of cheerleading today. 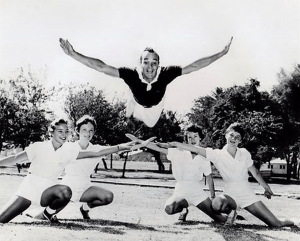 Herkie was a true legend and pioneer of the sport of cheerleading.